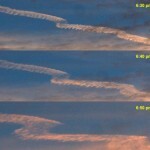 I explained the basics of contrails in my Jan 1, 2010 Sky Lights. Now that it’s winter here, I’ve been seeing a lot of them in the sky. They form preferentially in cooler air, and there’s always a lot of air traffic over Phoenix. But the other day I saw one that looked a little different — almost like it was forming in a corkscrew pattern. When I looked through my binoculars, I saw that it was indeed a corkscrew. You can just make that out in the photo above, but check out the thumbnail below for a magnified view of one section as it evolved over time. The images in the thumbnail have been enhanced to better show the details. The orange color comes from the setting Sun. My question was: What caused the corkscrew pattern? I’ve seen a lot of contrails, but I’ve never noticed this corkscrew effect before. Apparently, others have. If you follow the link above, you’ll read that the corkscrew pattern is formed by turbulence in the atmosphere. That’s not a complete explanation. It leaves one thinking that corkscrew contrails are related to the wind shear effects I discussed last week. And wind shear could be the cause, but the effect seems limited to the contrail and doesn’t show in any of the other clouds near that altitude. 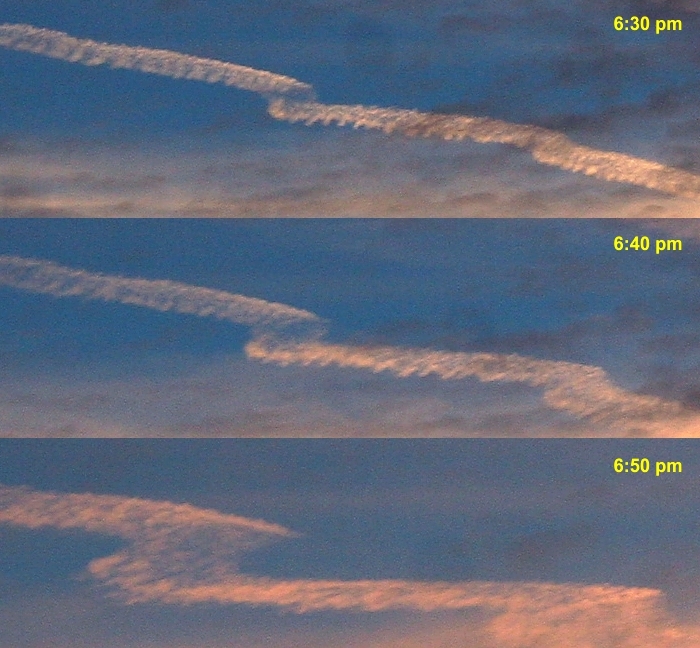 More than likely, this (and most) corkscrew contrails are caused by wing-tip vortices. Check out this excellent video showing the effect of wing-tip vortices on a layer of fog as an airplane lands. These vortices are a natural result of wings moving through air. So why don’t we always see corkscrew contrails? Quite simply, it depends on the direction of the wind compared to the direction of flight. When those directions are close to parallel, the corkscrew pattern can emerge. When there’s a crosswind, the pattern is more easily disrupted. You can see in the thumbnail that this contrail persisted for over 20 minutes before finally breaking up. That would not happen in a crosswind. The jet that made this contrail was bound for the upper west coast (or beyond). I didn’t check what direction the upper level winds were blowing that day, but in February our prevailing winds are from the east-to-southeast. And that’s close to parallel with the direction that jet was headed.